Coastguard rescue teams are continuing their search this morning following reports of a man walking into the sea at Fleetwood. The search stopped as darkness fell last night following a desperate search for the man, say the coastguard. And police would now like to trace a man who placed a call to emergency services to report a man walking into the sea at Fleetwood. Emergency services were alerted at around 3.55pm that a man had been seen in the water close to the Esplanade. The call was placed to the ambulance service from a telephone kiosk on the seafront by a man called ‘John’, who did not leave his full details, say police. Police searched for the man along with the Coastguard, but he has yet to be located. Officers would now like to speak to the man who placed the initial call to establish exactly what he saw. They would also like to speak to anybody else with information about who the man might be, or who might have seen him going into the water. Sergeant Andy Lawless, of Fleetwood Police, said: “We still have a search underway following a call from a member of the public reporting a man having walked into the sea at Fleetwood. We are working hard to locate the man but need to trace a man – possibly called John– who placed the initial call to find out a bit more information. Anybody with information is asked to contact police on 101 quoting log number 915 of May 16. 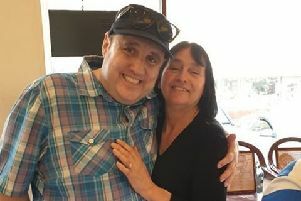 Peter Kay’s Tram Share: Much-loved comic continues his love affair with Blackpool – and tells chippy they do the ‘best steak puddings’!